Earth's Moon - Solar System Planets And Moons Section. Three great aids for viewing Earth's Moon. Moonwatch: A Complete Starter Pack for the Lunar Observer. 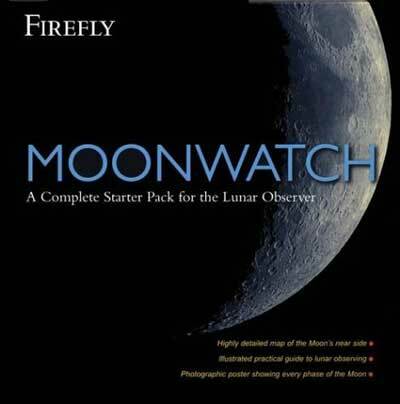 Firefly has just published a package, Moonwatch - A Complete Starter Pack for the Lunar Observer that shows they're already into the Christmas season. Three great aids for viewing Earth's Moon are within this sharp looking, light cardboard enclosure. These are; a book, a Moon map and a sheet of photographs. As written on the package's front, together these make a comprehensive, complete starter pack for lunar observing. Spirit rover Steering Problem Returns. NASA engineers thought that a steering problem on Spirit had cleared up, since they hadn't seen it in almost two weeks. Well, it's back. The glitch first appeared on Oct. 1, and forced the rover to stay put for 5 days while engineers searched for the cause. It went away after that, and returned again on Oct. 13. Engineers are now considering workarounds that would get the rover driving again, such as disabling the brakes on the steering actuator that keeps the misbehaving wheel pointed properly. This means the freely turning wheel might give the rover some difficulty as it negotiates rough terrain. Albert Einstein General theory of Relativity: Frame Dragging Confirmed. When developing his General theory of Relativity, Albert Einstein predicted that the Earth should drag space and time around with it as it rotates on its axis. NASA's Gravity Probe B spacecraft was launched earlier this year to help confirm this prediction, but an international team of researchers has beaten the spacecraft to a conclusion. By carefully tracking the position of the LAGEOS and LAGEOS 2 satellites - beachball-sized spheres covered in mirrors - they discovered that their orbit is being shifted by about two metres a year by this dragging effect by the Earth's gravity, almost exactly what was predicted by Einstein. The Virgo Galaxy Cluster is Still Being Formed. At a distance of only 50 million light-years away, the Virgo Cluster is the nearest Galaxy cluster to us. It's a giant structure consisting of hundreds of galaxies, both large and small, spiral and elliptical; 16 objects in this cluster are members of the famous Messier list of space objects. Astronomers have located a large number of planetary nebula floating in the "intercluster" space between galaxies, and theorize that they must be a fraction of the free floating stars and other objects which swarm around the cluster. By measuring the path of these objects, Astronomers have been able to track how the Virgo Cluster is still in the process of formation.